Want a hilarious story about learning to be present wherever we are… and what can happen when we’re not? These are my feet and this is me. Sometimes I’m not where I’m supposed to be. My brain gets crowded. There’s so much going on. I do three things at once, and get two of them wrong! Each day, there are many so things to think about. Getting ready for school, turning in homework, taking a math test, band solo tryouts, soccer practice…and it is a long way from your head to your feet. Be Where Your Feet Are! 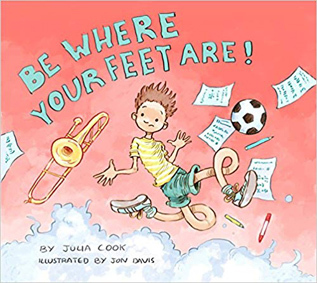 reinforces the concepts of mindfulness and being present in a fun way children will remember, and shows what can happen when we learn to appreciate the world – and people – around us.